You know how they keep telling us that Muslims who are exposed to the West will moderate and like us? Well, the many Western Muslims involved with ISIS/ISIL/The Islamic State have two things in common (other than being Muslim, which is, frankly, the key thing they all have in common): Western culture and the fact that Western culture hasn’t assimilated them–they’ve assimilated it into brutal Islam (a redundant phrase). That’s made clear by the Adidas clothing and rap “music” “skills” of suspects in the beheading of James Foley . . . if it wasn’t clear to you already. 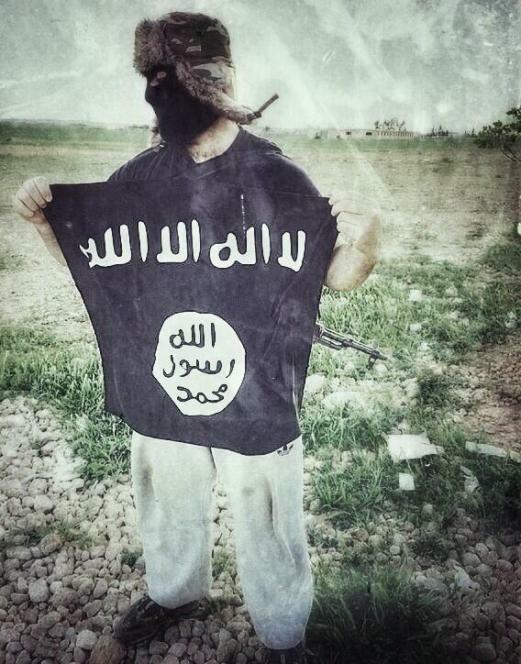 ISIS Brit Terrorist Abu Abdullah Al-Britani Likes to Wear Adidas . 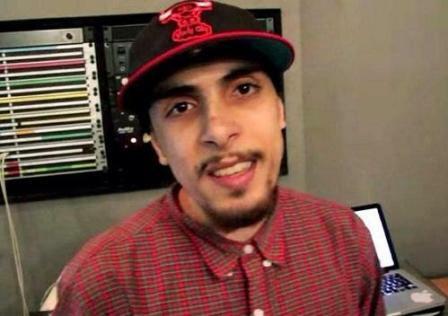 . .
ISIS Brit Suspect in Beheading of Foley, Abdel-Majed Abdel Bary, Likes Apple & Hip-Hop . . . Check out the photo, above, of Abu Abdullah Al-Britani, one of the British jihadis responsible for advising Brits how to travel to Syria and Iraq to fight on behalf of ISIS. He is included in some stories on the suspects in the Muslim beheading of James Foley. And–whaddya know?–there’s an Adidas logo on his sweatpants. And, as we know, many in the West are making a big deal out of the fact that another suspect–actually, THE KEY suspect–Abdel-Majed Abdel Bary, was involved in the hip-hop community as a rapper. He has an Apple computer, as indicated by the photo of him, above. None of this is news to me. In fact, for decades Al-Qaeda and other Islamic terrorist groups used rap to recruit members. I’ve written about it. So have others. And many of the most extreme Muslims are highly obsessed with Western pop culture. But, yet, the conventional wisdom idiots keep repeating the insanity: if only Muslim extremists could come here and be infused with Western culture, then they would love us! Um, no. As I’ve said time and again on this site for more than a decade, Muslims of the most extreme kind love to wear Levis and eat Baskin-Robbins ice cream. But they continue to hate Levi Strauss, Burt Baskin, and Irv Robbins (all of them were Jews), and all of their ilk. Again, Western pop culture doesn’t soften or moderate Muslims. Muslims use Western pop culture to hypnotize Western societies into bending toward them. That’s jihad. Pop culture jihad is part of jihad. It doesn’t make barbarians any less barbaric. Got it? Western pop culture hasn’t done a damn thing to civilize them. Not even close. Abu Abdullah Al-Britani should not be using an Apple computer. Apple computers include components created and designed by Israeli companies. For example, the flash-drive in an Apple was designed and built by Anobit, an Israeli technology company. Al-Britani should be punished for using the products developed by Infidels. I’d suggest a beheading as a fitting remedy. Actually I should have said that Abdel-Majed Abdel Bary, as the Apple user, should be beheaded, rather than Abu Abdullah Al-Britani. But both, I’m sure, are equally deserving of that remedy. As far as Abu Abdullah Al-Britney is concerned Jews and Israeli companies exist to provide Muslims with what they want. Dhimmis exist to provide Muslims with their material needs. In many ways not so different to the entitlement mentality that now prevails in Western countries except that it’s rigidly formalized like the Indian caste system. What’s different is that Western entitlement works from the bottom up and theirs operates from the top down which is why they’re working to flip it their way. Leftists can’t tell the difference or don’t care to for the moment, hence the solidarity. Like the caste system it’s as natural as breathing if you grow up with it. All this might seem hypocritical if you’re thinking about it like some kind of high school vendetta where your team has done well and you have some kind of pride in your achievements but that isn’t the way you should think about it at all. It’s only about your freedom. That’s why when people say organisations like ISIS hate American freedoms they’re saying more than they know. It’s not just a kind of outdated prudish disapproval. That’s not it at all. Pop culture doesn’t even civilize people in the U.S. On the contrary, it brings out their worst instincts. This becomes more and more true with the degeneration of pop culture. Even when Western culture was something admirable, savages could become immersed in it and still be barbaric. Hitler liked Beethoven and Mozart. A variation of this argument is that totalitarian countries will move towards Western values if we trade with them. That argument was used when the US recognized Communist Russia in the 30s, and again in the late 60s and 70s when Red China was recognized and trade relations developed. Now, of course it is also applied towards Muslim countries. Partly delusion and partly appeasement, this trade policy goes back centuries to colonial times. Al, just an FYI. . .
One of Hitler’s favorite works of music–if not his personal favorite–was the operetta “The Merry Widow, with music by Franz Lehar and the libretto by Viktor Léon and Leo Stein. The thing was, though, that Lehar was married to a Jewish woman (who converted to Catholicism and was later made an “honorary Aryan”) and Léon and Stein were Jews. Nonetheless, the Nazis considered “The Merry Widow” to be the highest musical form of “holy German” art. Go figure. Didn’t know that Merry Widow was considered the highest form of German art. I always thought it was Wagner. There is no figuring Hitler. He was an evil madman, and also a wimp who died like a coward. Israel for example is busy providing Palestinians with electricity, hospital treatment and funding. Do you see how terminal this kind of pride can be? Will liberals ever admit that they’re wrong? No way. Well, little ISIS Abu sand boy likes to play, does he? He is not “British” by any stretch of the imagination. A citizen of Britain, yes, but he ain’t British. Far too many amongst us cling to a hard and fast commitment to denial while mountains of evidence–here and everywhere else– more than suggests appeasement of Islam offers no more hope for a good result than tethering a cruise ship with dental floss in preparation for a category 5 tropical storm. They’re bold and getting bolder as their numbers increase in our midst. Hopefully–prayerfully– the non-Muslim world will be awakened to do more than stutter-step before the doomsday clock strikes twelve. IAWWI (Imagine a world without Islam). Ah, a moment’s relief! Yes Debbie, I sure do. I come from people who don’t. I used to be one of them. I know lots of people who don’t, and never will, even if there were 1,000 Debbie Schlussel’s occupying 50% of internet blogs and news web site writing spots, and on the airwaves, both radio and TV as well. Some people never learn. But LONG before . . . I knew something was up with Islam. Remember, I grew up in the age of Malcolm X etal, and when an “alterna-god” was being offered to certain people in America. It came from peoples in The Middle East, and was suddenly being “sold” in mass quantities to certain American citizens. I was VERY suspicious. Then came The Six Day War, and The Yom Kippur War. And the Munich Olympics, and November 4, 1979, October 23, 1983, and on, and on, and on, and on, before, after and still. The In Your Face Counterfeit nature of Islam is unmistakeable. Buddhists, Hindus, Christians, Jews, you name it, there’s no faith that has an “it’s our way or a behead-way” shtick. Islam does. Not just “extremists,” it’s Islam, plain and simple. We report, you die. That’s Islam. If I were in a coma, I’d know it. I think God was protecting me all my life. Teaching me truth, absolute truth. I always believed in absolute truth, for some reason, and still do. In my lifetime, I have seen America go from believing in absolute truths, to sanding, staining, shellacking, polishing and buffing the truth until it was no longer truth. Long before I knew anything, long before I ever touched any mind altering substance, I “got” it. Debbie, you keep doing what you do, and keep yourself as healthy and safe as God will allow. But many people will never learn. Am I supposed to be that surprised about this? *Yawn* I think it was Lenin (or was it Trotsky) who said that the capitalists will sell the Bolsheviks the rope to hang them. We’re still selling the rope by the boatload! Isil, ISIS, IS: They are the foot soldiers of the New World Order. SO, then do NOTHING to stop IS/ISIL/ISIS terrorism! FIGURES, especially if obummer and his pals the QATARIES invented IS/ISIL/ISIS to take out Assad. Things are not quite going the way the USA-Qatar alliance had hoped and IS/ISIL/ISIS have gone WHOLE HOG into Iraq…even Turkey is getting antsy about their incursions into Turkey. Well, the Saudis and Egyptians are pretty disgusted with the USA and Qatar right now and went ahead and bombed Libya’s version of ISIS/IS/ISIL the other day…without informing the USA OR Qatar….. well, I guess that put Kerry-Obamma’s nose outta’ joint!! Isis, brought to you by the KSA and Qatar. Fueled by Red Bull, American Weapons and Hip Hop. Clothed by Adidas and Puma and NIke and beats audio and various I products. Saudis are not “fed” up by anything. They underwrite all this nonsense for various reasons. KSA should be bombed. Egypt is a different case, they don’t like the Turks and Hamas and probably are the best ally in the ME for Israel right now. They don’t trust the US. KSA and Israel have an uneasy alliance vis a vie Iran. However, the better fit would be a Shia/Kurd/Israeli alliance aganist Sunni enemies. However, that’s just my opinion too bad the rhetoric from the camp is nasty toward Israel minus the azeris.